When Easter starts approaching, my family gets excited to hear what I’ll be making for the occasion. I always try to plan simple things to make because I like to spend my Easter with family and not in the kitchen preparing meals. After I get my shopping list together, I head to my local Food Lion and pick up Hatfield’s 1/4 Pre-Sliced Ham in the meat section along with the other ingredients for serving my brunch! It’s already sliced, so it cuts out of some of the work, and I really love the fact that the animals are ethically raised in an American Made and family owned establishment! An extra bonus is that there is a an Ibotta offer available for the Hatfield 1/4 Pre-sliced ham with Natural Juices! There are other Hatfield varieties available to choose from, so it’s easy to pick one up that fits your family’s size! Sometimes I go a little overboard preparing an Easter brunch for my family and I end up with quite a bit left over ham and other fixings. This Ham and Cheddar Pasta is perfect for either an Easter Brunch side or as a way to use any leftover ham the next day. It’s such a simple recipe to it takes very little time from start to finish. Using Hatfield’s pre-sliced ham makes this dish super simple (and delicious!) because it’s already sliced and all that is left is to dice it up into small bits. There are also only a few ingredients for this pasta and it takes less than 30 minutes to make. By using the pressure cooker, it makes this side dish really quick because it does all the work! The first step to making this is to saute the onions and garlic in butter. Adding the uncooked pasta to the inner liner and topping it off with the chicken broth. Releasing the pressure once it has cooked and then remove the lid. Perfectly cooked pasta! Adding the sliced cheese, shredded cheese, and cooked ham and stirring. The last step is to add in the milk, salt, and pepper! 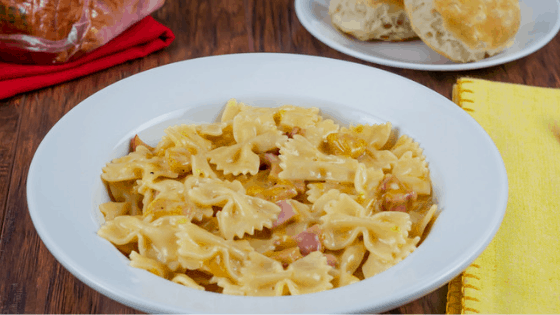 Pasta is always a great choice when entertaining, and this ham and cheddar pasta is always a hit when making it for mine. Kids love the cheesiness of the dish, and the onions are diced very small so that they don’t even know it’s included in the ingredients! Dicing the ham into small pieces add delicious flavor to this pasta dish that kids love! Turn pressure cooker to SAUTE and add butter, diced onion, and garlic. Pour in a 1 lb box of farfalle pasta. Pour in a 32 oz carton of chicken broth. Place the lid back on the pressure cooker and press the PRESSURE COOK/MANUAL and set the timer for 5 minutes. After the 4 minutes, perform a quick release and remove the lid after the pin has dropped. Add the sliced sharp cheddar cheese, ham, Parmesan cheese, and salt and pepper. Set the pressure cooker back to Saute and stir to melt the cheese. Add in the 1/2 cup milk to make creamy and serve once all the cheese is melted and blended.